Spending some time in the forest can be a very relaxing activity, especially when for recreational purposes. These days it’s extremely popular among people to spend time there, go camping in the forest, either alone or with family and friends. There’s nothing wrong with that of course, but there are some risks to it. There are unexpected situations like getting lost, so you need to know some basic ideas on how to handle that. We’ll dive into more details as we talk about how to survive in the forest. Many of these tips include how to prepare beforehand, what to do if you’re lost, what not to do; how to find food and water and how to send signals about your location. Of course, the first step (preparation) would be vital, and if you don’t prepare for the unexpected, then you’re in real trouble. We’ve compiled steps and tips to help you go through this process. First of all, before officially admitting that you’re lost, try to retrace your steps. Figure out if you can recognize elements or objects that you left behind and try to go back. This should be your very first step. And don’t panic. This may only confuse you further and you will completely lose any tracks you left and your chances of finding your way back will be lost. So, stay calm and try to think rationally. Be very focused about your whereabouts. While hiking (and you’re not lost) it’s a good habit to try and pay attention to the details; turn around several times and try to memorize the area. It won’t take more than several minutes, but do it regularly. This technique may help you in finding your way back in case you get lost. If you’re absolutely sure you are after all lost there are some steps you need to follow, learn a few techniques and as mentioned above, stay calm. 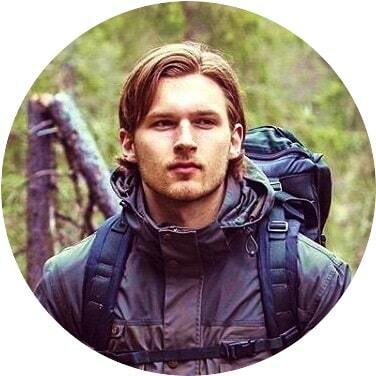 We have a great tutorial for how to survive being lost in the woods that you must check out! Your first and very important step is to find water. It is of vital importance, since you can build shelter nearby the water source and even set some snares – this can provide you with food. A good tip to help you find water – look for birds and if they fly nearby. Birds and other animals stay close to water sources. Another thing that may help you is to look for animal tracks – there are some such established trails. Be careful though not to reach some animal’s lair. Looking for trails is only a hint for you finding water sources. Look up for birds and trails. Both in combination are more reliable. If you find a water source, it may either be a river, stream or a lake. Remember to always boil the water before you drink it. If you have a filter or a purification system, this may be even better. So, we advise you to take along a filtering/purification system. But if you don’t have any such system, boil the water for at least 3-4 minutes (at best, boil it 10 minutes). If you’re in high altitudes (and remain in the forest) boil it longer than 10 minutes. This is due to the lower atmospheric pressure, so water boils slower. We also have a fantastic article with techniques on how to purify water when you’re stranded in the wilderness that you should check out. If there’s absolutely no water source around you (and you are discouraged to look too far away since you may lose too much energy and dehydrate quickly), try to gather rain water or dew. If you do that, you don’t have to boil the water but do so in case you use unclean containers or pots. You don’t have to wait for rain though. Since you’re in a forest, there’s plenty of moisture in the air. 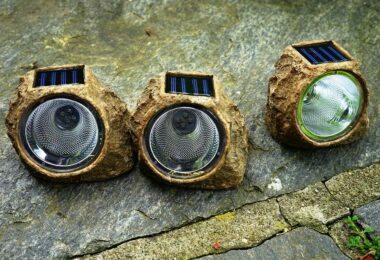 This would also mean you can use foliage to make your own solar water still. To make one, you need to first dig a hole. Make sure it’s a deep one, so you can place a container or a pot in its center, and the whole’s opening is much higher than the containers. Place inside a lot of leaves and foliage. Cover the entire whole’s opening with a plastic sheet. To keep it stable, place heavy rocks on each of the sheet’s corners. And make sure the sheet is slightly loose (not completely stretched). Finally, place a rock or a smaller stone on the plastic sheet, right above the container/pot. With time, water will start evaporating inside the hole, thanks to the greenhouse effects. The vapor will condense on the inside of the plastic sheet and will start dripping where the small stone is placed. The water will be completely clean (distilled) and ready for drinking, if your pots are clean as well. Next you need to find a place for shelter. We strongly advise you to carry at least a tarp with you, since it has multiple uses and is very handy and light. It can be lifesaving to protect yourself from pouring rain or heavy snow. Without a tarp or shelter you won’t be able to survive long completely exposed to the elements. Learn how to build shelters using a tarp. Practice before you go hiking in the forest, so you can be prepared. If you after all forget to take a tarp in your backpack, you could try to build your shelter using any tools, branches, foliage, etc. that you find in the forest. 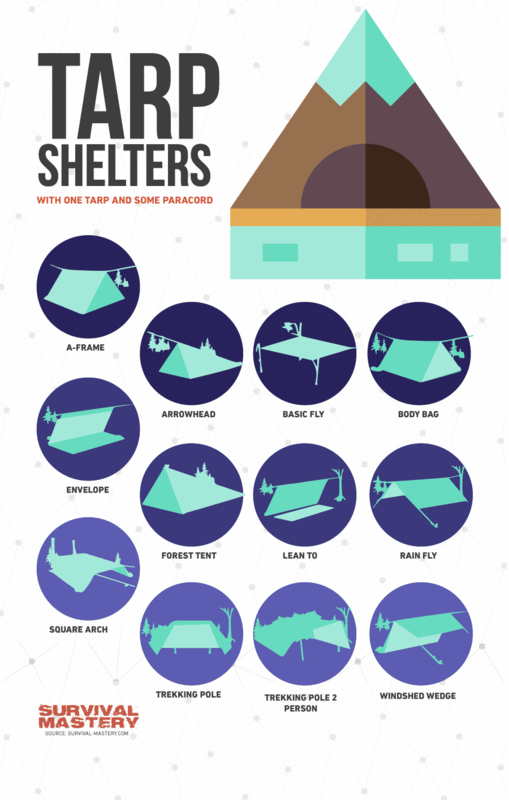 This may require that you have much more skills to build such a shelter, so either take a tarp (or skip the harder part) or learn how to make a primitive shelter beforehand. A very easy one is the ‘lean-to’ type of shelter. It can be done with a tarp or just several branches and foliage. If you have no tarp, do the following. Find a long thick branch. Prop it against a tree, at a 45-degree angle. Place smaller branches to either of its sides. It should look like a spine with a rib cage. Then place foliage, large leaves and thinner branches. Try to cover the entire ‘rib cage’. Of course, if you have no skills for building shelters, you may even rely on what nature gives you – caves. This may be much more dangerous, so be prepared. There may already be occupants in the cave in the face of bears, wild cats, snakes, etc. Animals also rely on any type of cave or earth hole to survive, so they may already have discovered these before you. So, if you want to avoid a violent encounter with an animal, you should learn how to build your own shelter with things around. 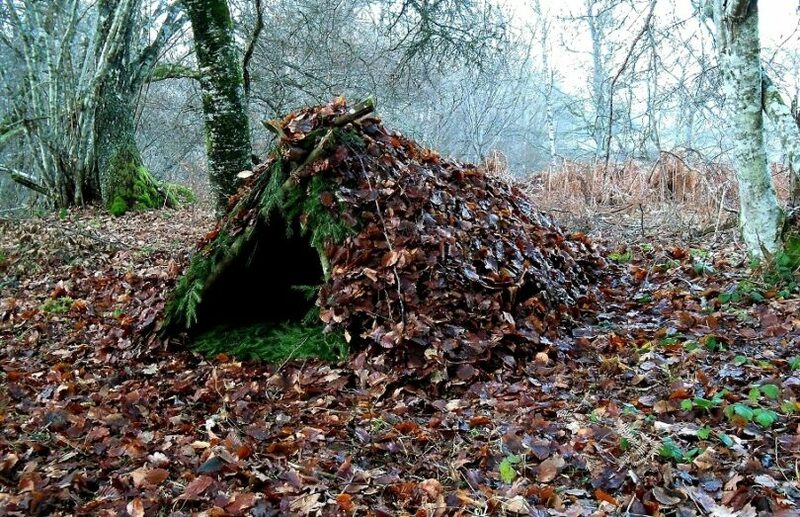 For this, take a look at our in-depth tutorial on how to build a survival shelter. When you have established your shelter, you need to build a fire. It will provide you with warmth and will be your ‘kitchen’. You can cook food and boil water. If you have run out of your food supply you will have to catch your own food. This may require that you know how to make snares or catch fish. There are many tutorials on the web showing how to do either of these. It is a very useful skill to learn before you go hiking. 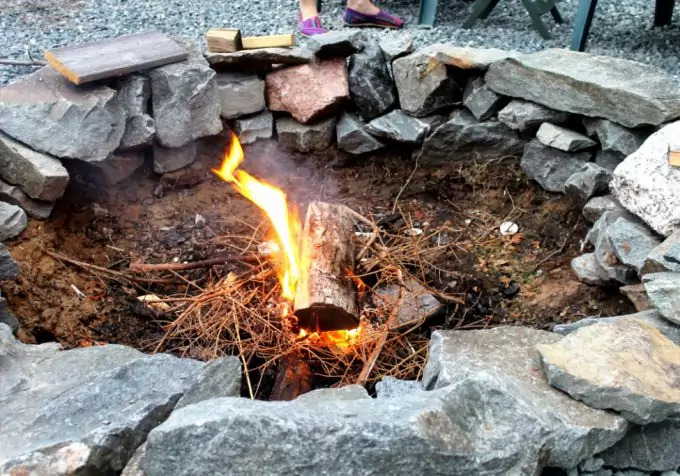 There are a few useful methods on starting a fire (if you don’t have a lighter at hand). You can use a mirror to ignite some timbers and twigs. Or you can build a fire plow. You will need a soft wooden piece, in which you should make a groove. Place timber and twigs in it and use a thinner branch to move it up and down, so it creates friction. Make sure the wood and twigs are dry. Even a little moisture may prevent the fire catching. When it does though, place more twigs to help the fire grow. Remember, the material you use should be dried dead twigs and branches; it can be anything, as long as it’s dead. You should also keep a small fire since it’s more manageable. Large fires require more fuel and are harder to maintain, especially if you don’t have much experience. Also, start a campfire away from any dead trees or bushes, or in any close proximity to any foliage or leaves. If conditions allow it (hot and windy weather) you can by mistake start a forest fire. To learn more about making fires in the forest, you should read our article on wilderness survival techniques. We have to add some very useful tips on surviving in the forest. The above steps are absolutely necessary for survival, and must be done. Along with these you need to know a few more things. You must let someone know where you’re going. Never do the mistake in the movie ‘127’. If you’re lost, your main hope is that a friend or relative knows that you’ve gone hiking. Let that them know exactly what you’re planning to do and where you’ll be heading off to. In this way, if you’re lost, your rescuers will have an approximate idea where to look for you. That is why you also need to know some signaling signs like signal fire, flashlight, using a whistle or shouting. You can also use the trees and place some marks on them. Very important is that you bring along a map, compass, GPS system or smart phone. Either of these can be of great help to you, if no one knows your whereabouts. First of all, learn how to use a map and a compass. If the batteries on your GPS or smartphone are dead, you’ll have to use the old-fashioned way of reading the map. We have a very well-documented tutorial on map reading so don’t forget to check it out. You should also not move much. It will be easier for the rescue team to find you. You may of course scout the area you’re at, get to know it better. If you’re certain there’s no one coming for you, you will have to make your way out of the forest. 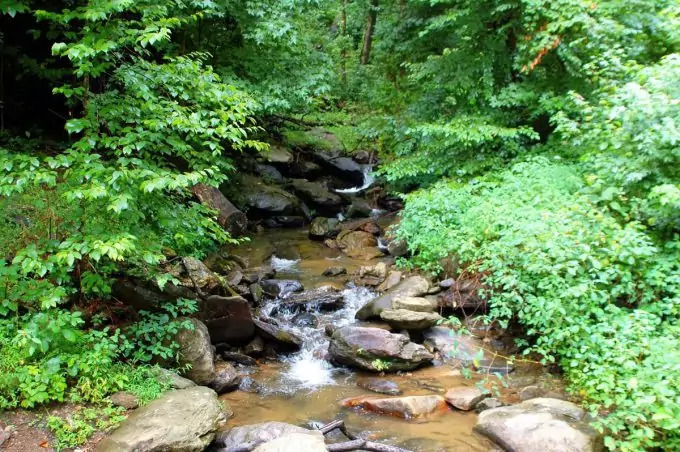 If you have found a stream, your best option is to just walk by it. Hopefully it will lead you either to civilization or to a larger water body. Also, as you will be left to your own means, always travel by day and when darkness falls, make a shelter and rest throughout the night. 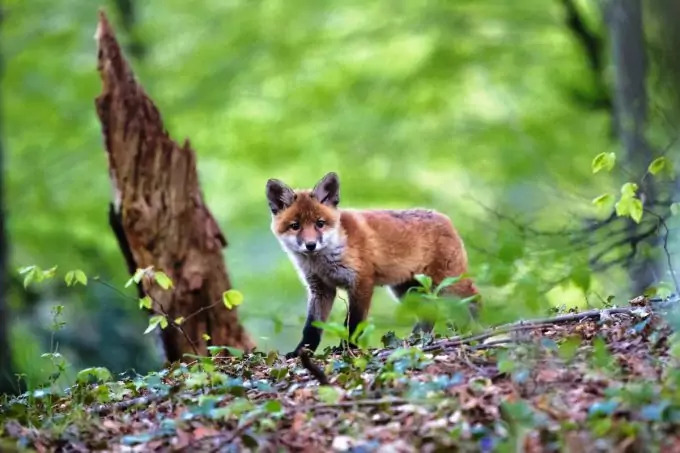 Another thing you must be aware of is that if you’re wandering in a forest, you should also be prepared to encounter animals. Usually those would be some bears or wild cats (maybe even wolves). Prepare by taking along a handy knife. If you forgot to take one, try to make your own using some branches from the forest, and make an improvised spear, using sharp stones. Of course, don’t actively engage in a fight. Always avoid fighting until there’s no way out of it. If you come face to face with a bear, talk quietly, spread your hands so you look larger (you occupy space so the bear is intimidated), and walk slowly. Don’t run, since the bear’s instincts are to run after prey (and catch it). Bears are very fast and you’ll have little to no chances of outrunning it. So, avoid close contacts with animals and don’t be the first to attack. If you encounter a grizzly bear, play dead. They won’t be interested in you, if they believe you’re dead. Leave the area only when you’re sure the bear is out of sight. 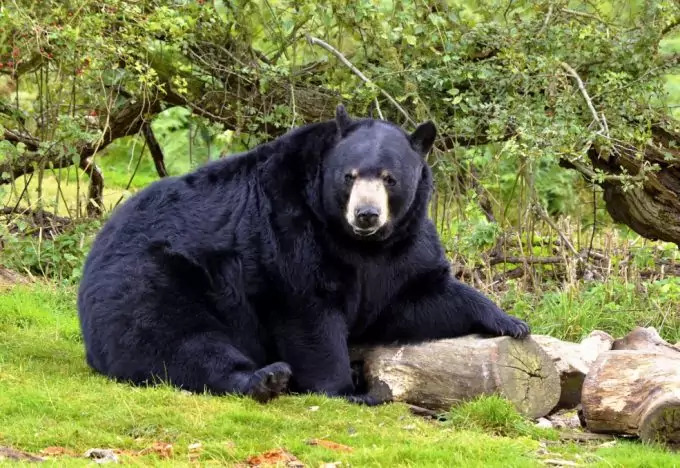 If it’s a black bear, you’ll have to fight with everything you have at hand. Tricks won’t play you any good. Either retreat slowly of fight if it attacks you straight away. You should also check out our article on how to survive a bear attack. Other animals you have to be careful about are insects and small reptiles. Due to their sizes they can crawl into your clothes and sleeves, so always keep them well tucked in, and avoid keeping exposed skin. Also be very careful about what you eat. If you’re out of your own food, you’ll have to rely on what the forest provides. It may be small animals or plants. The latter can be poisonous unfortunately. Unless you’re familiar with the plant world, you should better avoid eating any. If you’re completely certain that what you’re seeing are blueberries, by all means, eat them. There are white berries though that are poisonous. Also keep in mind that brightly colored fruits (yellow, white, red) can be poisonous (red, can at times be edible, but it’s a risk if you’re not sure). Dark blue and purple fruits are most of the time edible. Mushrooms are also a no-go unless you know what you’re doing. It is better that you learn to make snares and catch some wild rabbits or other small forest animals. If you’re still set on the plants around (or in the case that hunting doesn’t go well), you should check our article on wild plants you can eat. If you plan on hiking in the forest for some time, we strongly advise you to read beforehand about what plants and species grow in that area. Learn about which plants, mushrooms and fruits are edible and which are not. This may be also a good idea even if you’re not lost. Four safe foods we can mention here are oak acorn, pine, cattails and grass. Acorns are easy to find and stockpile. Pine nuts and the inner bark are also edible. For some taste to the water, you can boil some pine needles. It adds sweetness to the water. As much as it may surprise you, cattails are quite edible. All of its parts can be put to use. And finally grass – it may be thick to chew, but has carbohydrates and starch. Last but not least – keep some level of hygiene. 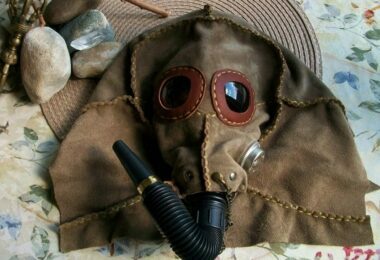 If you’re in the forest for some time and you have no idea when you’ll be saved (or find your way home) you’ll have to attend to your personal hygienic needs. Dental plaque can cause inflammation, pain and gum bleeding, which can be very disturbing and can provide fruitful ground of germs and bacteria. Also, keep your body clean, especially areas like armpits, private parts, between your toes, skin folds. This is because bacteria builds up and can cause rashes, allergies, inflammation, and all this can lead with time to diseases. One final and very important advice is to learn how to perform first aid. If you have prepared a first-aid kit, that would be ideal. Make your own manual at home about how to use it and in what situation to use what item. It may be more challenging to perform first-aid techniques without any items at hand. This may be tough for you, but if you’re alone in the forest you will have to know how to treat your own burns, fractures and cuts. These three are the most basic injuries you’d probably face, if any. According to the type of trip you’re going to take, the first-aid kit should be bigger or smaller which is why we recommend you take a look at the reviews for the best first-aid kit we did. And don’t forget to shout and try to attract attention to yourself. Plan a routine to shout, whistle or use a flashlight during the night. Also, don’t forget that the fire you’ve build may also attract the attention of the rescue party. 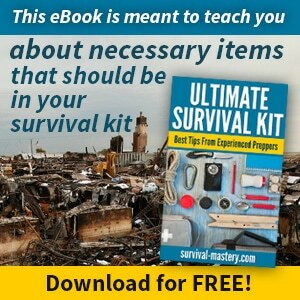 As long as you’re aware of these survival techniques and methods you have very high chances of finding your way back home. You have to know that the forest provides the means for survival – you only need to know how to use them. Know your area; leave markings on the trees everywhere you go; plan your food and water well (find water source or use the solar water still); stay away from animals as much as you can, keep low profile, and hunt only small animals (use snare or fish hooks); when on the trail use signals to help people locate you (if no one knows where you are). If your friend(s) or relative(s) have already alerted rescuers of your whereabouts (and you are aware of them searching for you), then stay put. Don’t forget the pocket knife, it’s a big helper anywhere you go in the wilderness.